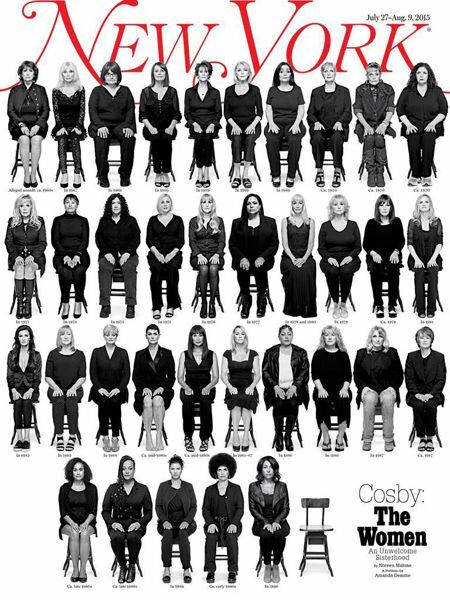 This is the powerful cover of this week's New York Magazine, featuring 35 of Bill Cosby's accusers, and one empty chair to represent his victims who have not publicly identified themselves. The accompanying story, for which all 35 women pictured were interviewed, is powerful stuff. A hacker has taken down NYMag's website, supposedly not because of the cover story but because [cn: violence; racism] he "hates New York," and the timing is coincidental ("I have not even seen the cover, LOL"), so the cover story is currently unavailable along with the rest of the site. But when it comes back online, which will reportedly be later today, it will be available here.